Why choose VMware Cloud over VPS hosting? There are considerable reasons to choose elastic VMware-based Cloud hosting over static VPS hosting and here are just some of them: data mirroring, multiple tier-1 upstream providers, redundant power sources with automatic switch-over and free DDoS protection. All these features make Cloud Hosting a bulletproof hosting solution for a mission-critical front-end website or service. Cloud hosting architecture provides seamless upscaling/downscaling resources without disabling and reinstalling your virtual servers, guarantees highest uptime and makes data loss virtually impossible - all for a very reasonable budget. We've built our Cloud infrastructure with high performance in mind: top-performing Intel Xeon CPUs, all-flash SSD data storage array by SolidFire and premium low latency networking with 10 Gbps port speed. 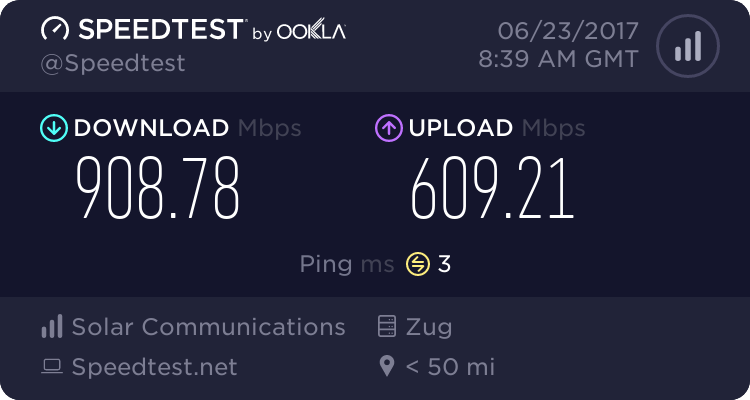 Our carrier-neutral data center in Zurich is directly connected to the Swiss Internet Exchange Point (SwissIX). Here's a list of most popular standard Cloud Server configurations. If you wish to build a custom Cloud Server, please click here. You'll be able to purchase additional resources or downgrade anytime later. DDoS protection is available for all Cloud Server configurations free of charge. Not satisfied with the preconfigured plans? Need a specific number of CPU cores, memory amount or storage space? Build a custom configuration that meets your requirements best and pay only for resources that you need. Once your payment is processed and cleared, it takes just a few minutes to deploy a new Cloud Server or clone an existing one. The whole process is fully automated and requires no special technical knowledge. Cloud Hosting is billed on pay-as-you-go basis, so you can pay only for resources that you need at the moment and add or remove them when needed with few clicks. Virtual Cloud Machines are more efficient money-wise when it comes to scaling and upgrading, especially in comparison to Dedicated Hosting solutions. Select a billing cycle that suits your needs best. You can choose to pay on a monthly, three, six or twelve months basis. Please be advised that the longer billing cycle you choose, the lower the monthly price will be. You can save up to 22% of your order if you go with the 12-month billing cycle. Should you need more resources for your web application or website, Cloud Hosting platform allows you to dynamically increase and decrease RAM, CPU and disk space with a few simple clicks and reboot. Start with a smaller package and grow when needed. All-flash SSD array by SolidFire with data-mirroring provides highest Input/Output rate and makes data-loss virtually imporssible. In an unlikely event of one physical storage server malfunction you'll still be able to run your Cloud Server from other physical servers on our Cloud network. Automatic backups and snapshots are available as well. Our cloud nodes have a self-healing architecture and automatic hypervisor failover with multi-layered security. Data-center infrastructure has been designed with redundancy in mind to avoid any power outage or network connection problems. Each Cloud server is protected from all types of DDoS attacks (UDP, TCP, ICMP etc.) scaling up to 10 Gb/s or 4 Mpps. This kind of protection is enough to mitigate against 96% of all attacks registered to date. Should you need a higher level of protection, filter capacity can be scaled up to 400 Gbps at extra cost. User-friendly yet comprehensive built-in firewall provides an easy way to create isolated or connected virtual networks, VPN connections, configure DHCP, NAT, setup dynamic routing or balance the load. If you need to set a DNS pointer record (PTR) for your IP address(es) to enable reverse lookup, log in your account control panel to do so. Select an Operation System from the list below and install it on your virtual cloud server with just a few clicks. Should you need to install a custom ISO, you can easily do it through the vCloud Director panel. Boot a virtual appliance with any OVF image of your choice that can be downloaded from a source or uploaded from your computer. This feature is available through the VMware vCloud director panel, log in your account and then click 'Add vApp from OVF' button to proceed. Additional CPU clock speed (1 GHz increments) is available as an add-on at extra cost. Don't hesitate to order hardware add-ons, extra bandwidth or IP addresses anytime your need it. Please be advised that you'll be asked to provide a reason for obtaining extra addresses when ordering more than 3 IPs. Without any doubt you can pay for Cloud Virtual Machine hosting and other products and services provided by CoinsHOST with Bitcoin (BTC), Bitcoin Cash (BCH), Ethereum (ETH), Dash, Litecoin (LTC) and Nextcoin (NXT). We treat decentralized currencies based on encryption as completely legit payment methods and encourage our clients to pay with them. Besides these P2P currencies, we accept a wide range of other payment methods and digital currencies. These include but are not limited to: PayPal, VISA, MasterCard, American Express, Discover, Bank Wire, WebMoney, QIWI and Perfect Money. CoinsHost is reviewed by 82 customers with an average rating of 4.05 out of 5.